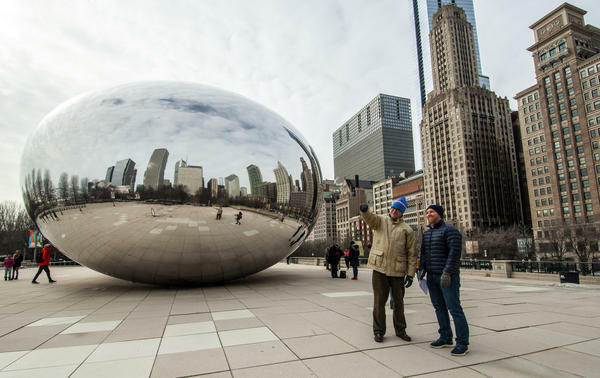 That’s what most people call “Cloud Gate,” a sculpture by Anish Kapoor that has become a favorite spot for tourists taking selfies. That’s because the Bean’s mirrored surface reflects back its admirers against a stately backdrop of the skyscrapers that line Millennium Park. On a recent Monday morning at the Bean, the Chicago Tribune’s Pulitzer Prize-winning architecture critic Blair Kamin (@BlairKamin) says the Bean builds on Chicago’s legacy of modern design. The steel sculpture looks lighter than air, but it weighs 110 tons, Kamin says, conveying an accessibility that belies the intense engineering that went into making it — not unlike the park itself where it sits. Millennium Park sits atop an old rail yard, and Kamin says it has become a “new town square” for a city that’s often divided by race and class. The Bean’s design fits into that tradition, too. Another icon of Chicago that uses curves and digital design to reflect nature is the Aqua Tower, which opened in 2009. Designed by architect Jeanne Gang, Aqua “was imagined as a vertical landscape made up of hills, valleys, and pools,” according to its project page on Studio Gang’s website. That’s a departure from the tradition of modern architecture that made Chicago famous. 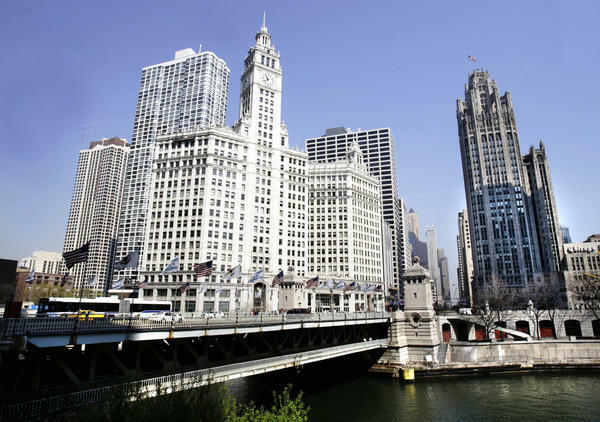 For that, Kamin says it’s hard to find a better example than the building long known as the John Hancock Center, recently renamed 875 North Michigan Avenue. Kamin says it’s not just the shape that makes Hancock an emblem of modern design. Chicago’s skyscrapers have a tradition of expressing the underlying structures. Another Chicago skyscraper that is decidedly not blue collar is the Lake Point Tower. Completed in 1968, its unusual Y-shaped plan was designed to maximize privacy for the building’s residents and give every unit a view of Lake Michigan, according to architect George Schipporeit. Like Aqua, the Lake Point Tower has a curved form that stands out against the right angles that typify Daniel Burnham’s 1909 Plan of Chicago. While many of Kamin’s favorite buildings celebrate common people, there is one standout Chicago structure that draws on the old palaces and cathedrals of Europe: the neo-gothic Tribune Tower. “It has flying buttresses, it has grotesques — those are gargoyle-like sculptures that signify the importance of freedom of the press — it has this gothic crown that stands out beautifully alongside the clock tower of the Wrigley Building,” Kamin says. The Tribune Tower also symbolizes the evolution of Chicago’s skyline, Kamin says. After more than 90 years in what Kamin calls the newspaper’s “cathedral of commerce,” the staff of the Chicago Tribune moved out in 2018 to make room for pricey condos. Chris Bentley and Marcelle Hutchins produced and edited this interview for broadcast with Kathleen McKenna. Samantha Raphelson adapted it for the web.